Alan is one of the world's top pipers. 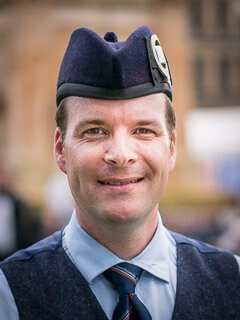 His career highlights include winning the Gold and Silver Medals at the Northern Meeting, the Gold Medal at the Argyllshire Gathering, the Jig events at both Oban and Inverness in the same year, overall winner at the Donald MacLeod Memorial competition (2009) and overall winner at the Masters' Invitational (2009). Formerly P/M of the grade 1 Abbotsford Police Pipe Band, Alan has been a member of the Simon Fraser University Pipe Band since 1995. He has won the World Championship with the band on several occasions. Alan has performed as a featured soloist at the band's concerts at Roy Thompson Hall in Toronto, the Glasgow Royal Concert Hall, the Sydney Opera House, and both the Lincoln Center and Carnegie Hall in New York. Alan succeeded Terry Lee as pipe major in 2013. He practices as a barrister and lives in Abbotsford, BC.